Courses available in London, Birmingham, Sydney, the United Kingdom, Ireland, North America and Australia. Certification from many different cities, including the U.S., Europe, Central and South America, and Asia. Located in Chiang Mai, Thailand, location is a huge program highlight. If you’re looking for a culturally-immersive learning experience with a guaranteed job at the end of the course, this is it! On-site at various paradise locations around Thailand, including Samui and Phuket. 100% online & fully optimised for mobile/tablet access - study from anywhere in the world. You can also sign up for a free 2-day course before you commit to buy (see ‘Visit Site’ link above). All courses offered online. Therefore you can complete your study from anywhere in the world. Online and classroom learning TEFL opportunities and certifications available. Both international TEFL certification classes and an online class are offered. SEE offers a 4-week TEFL course as well as a paid internship. Internship is identical to the 4-week course but is only 2-weeks long and tailors to those teachers who don’t want to commit to staying in Thailand longer than 5 months. 120 Hour TEFL Certificate. Graduates will receive a physical certificate from both TEFLPros and ACCREDITAT. 4 courses offered: preliminary course, certificate course, diploma course and the advanced diploma of education studies in TESOL. Courses differ based on whether you want an introductory or professional course. You don’t need any qualifications, though that non-native speakers must have a good understanding of English with a Cambridge CAE qualification or equivalent. The 4-week TEFL course requires English language ability of IELTS 6.5 equivalency. However,you must be a native English speaker to attend the internship placement. Bachelors degree, any subject, native English speaker. Non-native English speakers accepted subject to application approval. You don’t need to be a native English speaker to enroll, but you must have a good level of English. See the site for minimum English test scores as a suggested level for non natives. You don't need to be a native English speaker but you must have a good standard of English, such as reading and writing at a high level. Two online TEFL certificates available: Professional 120-hour certificate and the 60-hour foundation TEFL certificate. Online, 11-week long, 170-hour TEFL and TESOL certifications are available. There are no online certifications available. Study is limited to the Chiang Mai location. No online courses are offered. TEFLPros only offers an online certification. All those who pass get a physical certificate from both TEFLPros and ACCREDITAT. All courses offered are online only. Job prospects depend on both the course you decide to take as well as where you take the course. Graduates are offered lifetime job assistance, including learning how to contact schools directly and network effectively. Graduates are guaranteed a job after completing the 4-week course. *Guaranteed job after successful completion of the course. TEFLPros has the TEFLTribe Facebook group where job opportunities, tips and career advice are posted. This is a real-time network for job placement. You will also receive an interview and resume guide to help build your TEFL resume. There are many jobs available for TTC graduates around the world, from Spain to Turkey to South Korea. 120-hour TEFL costs $199 and the 60-hour foundation TEFL certificate is $279. Onsite pricing varies greatly and will depend on program choice. Course costs range from $1,595 to $2,495 for an onsite TEFL certification course. The course offered in Pattaya, Thailand costs $1,525 ( accommodation not included). An online certification costs $1,395. Course costs $1,495. Those who know anywhere from 3-6 weeks in advance that they want to attend the course can save up to $200 by signing up early. Paid internship: £1,095 ($1,365) TEFL: £1,140 ($1,435). Prices range from $159-$249, depending on the course you choose. Happy mediums are hard to come by. I can never seem to find that perfect balance between what I want to do and what I should be doing. This is especially difficult when we are talking about both working and playing hard. That being said, I can finally say I have found my balance working as a teacher abroad in Thailand. On my breaks, I am able to fly down south to some of the most beautiful beaches in the world or explore mountainous terrain in the north of Thailand. While the pay might seem insufficient at first, the cost of living in Thailand is so low that I have been able to live more comfortably here than I have in my entire life. The benefits are reaped by more than just the potential teachers too, however. International studies measuring English proficiency show that Thailand falls at 62 out of 70 countries ranked. The EF English Proficiency Index (EF EPI) also showed that other Asian countries are doing well in comparison to Thailand, ranking it the third worst Asian country in English proficiency. Tourism is also one of the biggest job industries in Thailand, with an estimated 8,140,000 jobs in 2025 in tourism according to the Authority on World Travel & Tourism. So now that you know you are needed, let’s talk about how it is we get there. What is the Difference Between TEFL & TESOL? TEFL stands for teaching English as a Foreign Language, and TESOL stands for Teaching English to Speakers of Other Languages. They are, essentially, one of the same, as both certifications are interchangeable when trying to find a job overseas. Both certifications give you the qualification required to teach abroad in a classroom where you may be the only person able to speak proper English for miles. Regardless of your degree (or lack thereof, as many schools don’t actually require one) getting your certification will help you take on a classroom abroad with confidence. Never has it been so easy to travel for work than it is with having a TEFL or TESOL certification. While you may have completed your certification in Thailand, that doesn’t mean you are confined to this country’s borders. Oftentimes, those who teach in Thailand will jet off to other Asian countries after they feel as though their work here is done. Schools are always in need of native English speakers. Back home, you may face a job market that has left you to the confines of your parents’ basement, flipping burgers or bussing tables until you can really utilize your degree. Having a TEFL certification opens up so many opportunities for work, from having your own classroom to private tutoring. A job is never hard to come by, especially in Thailand, for those who have a TEFL certification. If you get your TEFL certification onsite, you will meet many new people who are like-minded in that they all want to teach abroad. I have made some of my best friends through my course, and these people will most likely become your support group as you tackle working and living abroad. What better way to make your resume stand out other than by having some international work experience? Some may raise their eyebrows at you when you decide to teach abroad with a degree that doesn't’ necessarily correlate with education, but working abroad is one bullet point on your resume that will make you stand out. If you have a degree in biology, you can teach science in Thailand. Have a passion for math (although this seems highly unlikely to be true of anyone)? You can teach algebra! 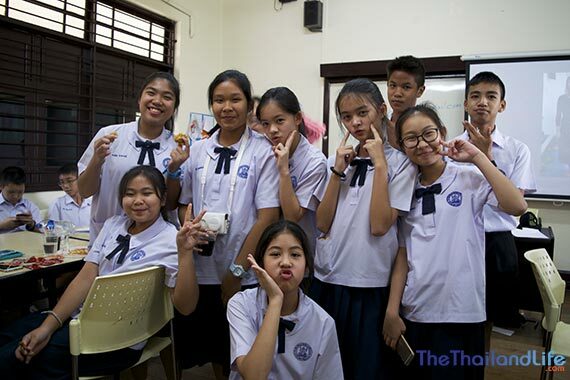 While you may have initially traveled to Thailand with the intentions of teaching English only, many schools are in need of different subjects taught in English. Again, this will look great on a resume, and you find yourself learning more about a specific subject when you need to create lesson plans about it. I’ll be the first to say that I was never a fan of children. I didn't know, however, how much I would fall in love with my students while teaching abroad. At the end of my first term, I had an overwhelming amount of students crying and taking one too many selfies with me on the last day of school. It doesn’t get more rewarding than that. While teaching abroad, you will slowly learn the language of the country you find yourself residing in as well as learning so much about different cultures and communities. So, now you know what the potential a TEFL holds, you'll need to choose a course. There's a ton of them out there, which can be overwhelming. But don't worry, I'll guide you through the process. Let's start with some key considerations when choosing your course. 1) Does the course offer onsite support even after you graduate? As someone who has gone through blood poisoning, a stolen passport and many other unfortunate events, I can not stress how important it is to have some support after you arrive in Thailand. The language barrier is hard enough without having to explain to the police that your passport is gone. 2) Where is the course located? I highly recommend picking a course that is located in Thailand already. It gives you the chance to slowly immerse yourself into the culture before being thrown into a classroom of your own. You can also narrow down your search to where it is in Thailand you would prefer to go. 3) Do they help you find a job? 3. Finding a job in Thailand is simple, if you know how to do it. Having to reach out to schools independently can be difficult, because of the language barrier and for the simple fact that you probably don’t know what you’re doing yet. Courses that offer job support when you first start out as well as throughout your time in Thailand come in handy, especially if you decide to change schools at some point. 4) Can the certification be used outside of the country it was intended for? While I think most people who come to Thailand fall in love with the country, many find themselves traveling to Japan, Myanmar and other neighboring countries after deciding it wasn’t for them. Don’t find out when it’s already too late that your certification can be used in only one country. Many companies will act as the middleman, getting you set up to take the TESOL course abroad with yet another company. During my time getting my certification, some of my fellow soon-to-be teachers had paid over double of what I had for the same exact program. Do your research to find the best priced company without lowering your standards on quality. 6) What age group do you want to teach? While many TEFL courses give you a general certification and you find a school teaching the grade of your choice, many certifications are tailored specifically for a certain age-group. Do your research so you don’t enter Thailand thinking you’ll be teaching Kindergarten only to be in a classroom full of high schoolers. 7) Look at the course’s reviews. A company’s website might blow you away, with it’s distracting colors and promises of riding elephants into the sunset while getting your certification. The quality of the program, however, could be seriously lacking, despite it’s flashy website. Right, now we know what we are looking for in a course, let's find you the perfect one. Oh, but first, in true Thai style, let's take a selfie! Picking a company to get your TEFL certification with is one of the biggest decisions you will have to make when deciding to teach abroad. You shouldn’t worry about finding a certification, however, with so many out there to choose from, you need to make sure you find a reputable company that's a good fit with your requirements. This company can and most likely will be the catalyst of your experience abroad, especially in the first couple of months. Picking the wrong company can complete affect your entire experience teaching abroad. If you choose a program provider whose instructors are incompetent, you will find yourself struggling more with your students than they do with your disorganized lesson plans. In order to avoid anymore stress than you have already taken on at this point, I’m here to help navigate the landscape by picking out the 6 most highly rated courses and comparing them based on a number of different factors, which should make your search much easier. I'll cover the best course you can take in Thailand, and the best online course. By the way, if you can't be bothered to read on, just go back up the page and see my comparison table for a quick overview of each. Then click on the ‘Visit Site' buttons to do just that. If you want to study in Thailand, SEE TEFL is number 1, and for good reason. 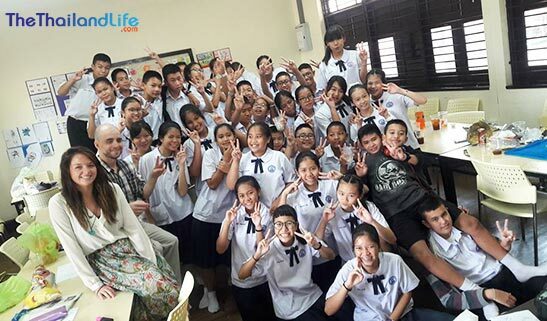 Located in Chiang Mai, Thailand, hopeful teachers can check off location as being one of the highlights this program has to offer. If you're looking for a culturally-immersive learning experience in Thailand, with a guaranteed job at the end of the course, this is it! SEE offers a 4-week TEFL course, as well as a paid internship. The internship still contains the TEFL qualification, but with the remaining time spent at a paid placement that lasts 5 months. The 4-week TEFL program accepts any nationality, so long as you are competent with the English language: the recommended level is an IELTS 6.5 equivalency. In order to be eligible for the internship you to be a native English speaker and be comfortable using Microsoft Word or OpenOffice. They also list that participants must be adaptable to unpredictable situations and be friendly and flexible. Aside from these requirements, I can’t emphasize enough how being ready for anything and being patient when things go wrong is one of the most important requirements for anyone looking to teach abroad. Regardless of the program you choose, things are oftentimes bound to not go as planned at some point. There are no online certifications available. The course is run solely from the Chiang Mai location. Graduates are guaranteed to get a job shortly after completing their 4-week course, which is great because course participates will already have been a month without working and could know doubt do with the money. The TEFL course costs $1,595. However, if you sign up between three and six weeks in advance you can get up to $200 off the standard price. The paid internship costs $1,295. TEFL Heaven presents a great alternative to SEE TEFL if you'd rather study on an island than up in Chiang Mai. TEFL training takes place over three weeks in a tropical Thai location (Koh Chang, Krabi, Koh Samui, Phuket, or Koh Phangan), after which TEFL Heaven will place participants in schools around Thailand based on individual preferences. The Paid Internships Thailand program is 3 weeks TEFL training on a paradise island and then a paid teaching job which would be anywhere in Thailand for 5 months or more. There is also a TEFL certification option for those without a degree, but the job guarantee is not given; though assistance is provided. Only native English speakers with a degree can apply for the Paid Internship program. Native English speakers with a Bachelor’s degree are guaranteed a paid job in Thailand after the TEFL certification. 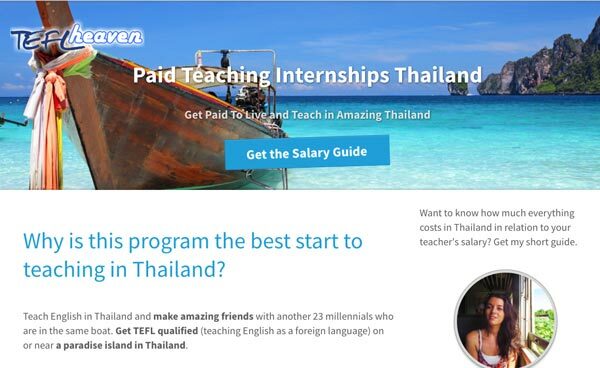 The Paid Internships Thailand fees are 1,095 GBP (1,365 USD). You'll receive a 120 hr TEFL certificate, a guaranteed teaching job, full time assistance, visa help and accommodation for the 3 week TEFL certification period. The TEFL Certification course is priced at 1,140 GBP (1,435 USD). You'll receive 4 weeks of TEFL training, guaranteed job placement, preparation assistance and visa help. i-to-i, who have recently merged with LoveTEFL, offer courses in London, Birmingham, Sydney, the United Kingdom, Ireland, North America and Australia, as well as online courses and paid internships in Thailand, Vietnam and China. i-i are popular because of the flexibility to study either in class or online, and because they have established a respected reputation among teflers and education institutions worldwide. There are both online and classroom learning TEFL opportunities and certifications available, both domestically and abroad. You don’t need any previous qualifications to take an i-to-i TEFL course, though they do ask that non-native speakers have a good understanding of the English language with a Cambridge CAE qualification or equivalent. There are two online TEFL certificates available: A professional 120-hour certificate, and a 60-hour foundation TEFL certificate. There's also a big discount on at the moment! Job prospects depend on both the course you decide to take as well as where you take the course, but you won't be without work having taken one of the i-to-i courses. They have hundreds of employers across 23 countries providing the top salaries, perks and progression opportunities. You can search for jobs by region on their website. The 140-hour TEFL certificate is currently £249 and the 120-hour TEFL certificate is £149. Prices for paid internships start at £895. The International TEFL Academy is on a par with i-i and offer similar opportunities. You can get your certification from many different places, including the U.S., Europe, Central and South America, and Asia. They also offer a great on-site training opportunity for those wanting to teach in Thailand. You will first jet off to Phnom Penh, Cambodia, where you'll spend three weeks before going to Pattaya, Thailand, for the last week of your training and the presentation of your certification at this seaside location. You don't need a degree or any other qualification to do the course, but the company does advise you that age limits to teach English abroad vary by country and school, as does whether or not you need hold a degree. For the most part, however, neither will stop you from getting a job in Thailand. An online, 11-week long, 170-hour TEFL and TESOL certification are available. Students and graduates are offered lifetime job assistance, including showing participants how to contact schools directly, network properly and utilize things like job boards. Tuition ranges from $1,595 to $2,495 for an onsite TEFL certification course. The course offered in Pattaya, Thailand costs $1,525 (accommodation not included). An online certification costs $1,395. TEFL Pros is 100% online. It is a comprehensive, state of the art course designed for the digital generation. Compatible on all mobile devices, tablets and computers, it is well-suited to those who want to study anywhere, anytime. What's more, they also offer a 2-day introductory course – FREE. So you get to test-run the course before you fully commit to buying. That's pretty cool and not something any of the other online companies are doing. 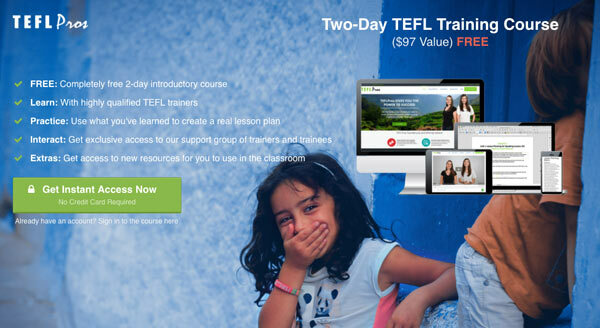 TEFL Pros offers a a 120-hour TEFL online course, but with some significant differences to others of the same length, which is reflected in the price. 10 modules, 32 units, 17 hours of classroom observation video, worksheets, trainer chat videos and much more. I have to say, I was very impressed with the content in course. Students do not need to be native English speakers to enroll in TEFL Pros but must have a high level of proficiency. Check out the site for recommendations how good your English should be to take the course. Graduates will receive a physical certificate from both TEFLPros and ACCREDITAT. I really dig the fact that they post you out a physical certificate and don't just email one for you to print out. Oh, and course enrollees also receive an interview and resume guide, which will help build your TEFL resume. TEFLPros has what they call a TEFLTribe Facebook group. In this group you'll find job opportunities and tips, and advice from the course leaders, Jos and Whitney – who both have many years of experience teaching overseas. The TEFLPros community can also help each other by posting tips and advice. The idea behind this FB group is that it creates a larger, real-time network for job placement. The 120-hour course costs $349, which is great value. The course delivers the quality of an in-person course with the flexibility of a deeply immersive digital learning experience. For this price, you receive training by two highly-experienced TEFL teachers, both of whom teach English to business students, private companies, etc. All of the courses are offered online only, therefore you can complete your TESOL from anywhere in the world. TEFL Training College offers four courses, including the preliminary course, the certificate course, the diploma course and the advanced diploma of education studies in TESOL. Each course differs depending on whether you would like an introductory course or something more professional. You do not need to be a native English speaker, however, the website does state that you must have a good standard of English, such as reading and writing at a higher level. All of the courses offered are online only. There are many jobs available for TEFL Training College around the world, from Spain to Turkey and even South Korea. That's it! Pick your course, get your certificate and the world's your oyster. And don't forget, when you've finished your course, you can find lots of teaching jobs in Thailand right here on the TTL Job Board. By Kelly Iverson – Seasoned TEFL teacher & travel buff. Hi, I have a long-standing affection for Thailand and have been visiting for over 40 years and lived and worked for 4 years with an international company.I have a university degree and fellowship of two UK professional Engineering institutions (Chartered Engineer)I’m 63 now - a daily gym goer and fit as a fiddle mentally, socially and intellectually.Do you reckon I’d be able to get a job teaching English in Thailand? Or is age a barrier? Do you know of any senior folk reaching? Hi there, I am giving serious consideration into the TEFL course i have been wanting to do this for many years now but have had commitments here in the UK however now i am free of all commitments and ready to take the course, however i am 42 years old ... will this be a problem for me? 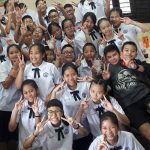 i have a Thai partner and plan to get married so would want to stay in Thailand but i have read that if i want to work legally as a teacher in Thailand when it comes to applying for a work permit and visa to remain in Thailand i would need a batchelor degree to work legally, could you help clear this matter for me as i would hate to go through the course only to be dissappointed to know i would be there illegally. At 42 you'd have no problem getting work. The school you get a job at will help arrange the work permit for you. You don't need a bachelor's degree, though some jobs may specify that. There are tons of teachers teaching with a TEFL and no degree. Where are you planning to do your TEFL? Wow .... really!? if this is the case i will be wanting to start a course between May and August and i would like to do my TEFL at the Krabi Au Nang location. the reason i got disheartened with the whole TEFL course was because every job vacancy i have come across has always stated that i would need a degree so then i checked i think on your webpage that the visa and work permit for teaching would not be granted unless i had a degree, if this is not the case i am 100 percent going to quit everything here in the UK and leave for Thailand this year. Any more tips for me about this process? Also your article on marriage and the sinsod is very informative and clears up something i really could not understand about Thai culture, your blog page has been the best thing i've read and given me hope that i can make it in what seems a minefield to people wanting to start a new life in Thailand, so thank you very much. I want to work in Thailand, I am 18 with only (good) A levels, will this restrict me completely? I understand it will make finding a job harder but would it be possible? Also, would I be able to complete the TEFL course anyway, as I read that they do not expire? If I would be unable to teach, are there any other job opportunities that would be available to me? Any advice would be great, Thank you! Hi Megan, being 18 won't restrict you. Besides, by the time you complete your TEFL and get started you'll be 19, or almost. And like you say, you can do the TEFL now anyway and it won't expire. I'd say teaching would be a good route for you now. You'll certainly find work once you have a TEFL, and it gives you the opportunity to teach in other countries too. I am not a degree holder and a former bank administrative officer from Malaysia. I intend to take up an English Language course in Thailand and thereafter would enable me to teach the language there.Can you please give some ideas or suggestions.Thank you. Yes, have a look at SEE Tefl and TEFL Heaven in the post above. Hi,I am an Indian with an Engineering (Undergraduate) and a Management degree (Postgraduate). I studied in English medium schools and colleges throughout. I am a Sales professional with 4.5 years of experience. I am keen to pursue teaching as my career. However, since English is not my native language, which TEFL course providers will accept me? Also, would it be impossible for me to get a job in any country post course completion? Hey Kevin, Your post has been very helpful since I'm contemplating getting my TEFL certification in Thailand as I'm interested for a teaching post there as well. I'm from Malaysia btw so as you can see I'm not a native English speaker although my degree and postgrad degree learning has all been conducted in a full English medium. I know that most employers will prefer the native speakers but do you have any advice or tips for me to go on. Right now I'm still considering whether to take my certification in Malaysia (cheaper in Malaysia) or Thailand (easier to apply for job if I'm already there). Any input is really appreciated by me. Cheers! My advice would be to do a course in Thailand with SEE TEFL or TEFL Heaven, because as you mentioned it will be easier to walk into a job. These companies do internships too, which lead directly to employment. They also have contacts to help you find work once you graduate. That's not to say you won't get a job if you do your course in Malaysia; I'm sure you will (your written English is obviously of a good standard), but doing it this way gets one foot in the door. The other advantage of studying here is that you will have the experience of living here and acclimatizing to the culture while you study, so by the time you start a job you will already be settled in. Am I missing something? Is there any discussion or itemization in your chart about a TEFL program's accreditation in your chart or article?Any qualification that's truly professional--and good for like--would have an independent body accrediting its curriculum and program. Additionally, there would be ongoing 'moderation' or reviews of each TEFL course to ensure they're delivering the program according to prescribed standards.The best schools are increasingly looking at a program's accreditation when reviewing job applications. Absolutely, Ken. All TEFL providers in Thailand have to be Licensed by the Thai Ministry of Education to conduct TEFL Training courses. SEE TEFL and TEFL HEAVEN, two of the best operators in Thailand have this license and are also ercognized by the Thai Industrial Standards Institute(TISA) (ISO 9001 certification).Thanks for making this point. I will add a section to the post. Is it possible to teach at a Thai university with a post graduate degree ? I'am 56 yrs old with my daughter in Thailand starting teaching next month. Was a junior lecturer at university many years ago. Being with a Multinational pharmaceutical company ( ASPEN / Glaxo ) in sales for 10 yrs. Can teach basic Anatomy and Physiology. Selling Asthma drugs , Antibiotics and urology products etc. Still very active no chronic illnesses. I'm not sure about this. I would imagine that you need to be a PhD student or have completed a PhD. That said, you never know. Because of your work experience, university may be interested in you lecturing on working in this industry. All you can do is make contact with some universities and make enquiries, which is actually best done in person when you're in Thailand. Hi Jerry, as long as you have a valid CELTA/TESOL then you will be able to find work. While it is true that some schools and language companies may require you to have a degree, it is not true for all. Great information and recommendations for courses. One question though, is there any age restrictions to teaching or being able to get a teaching job in Thailand?This is coming from someone who has been on earth for some considerable years!Regards,Keith. Thank you thank you soo much! I am deciding on the Internship between Tefl Heaven or I-to-I, making a decision within a week. Your advice would be gladly appreciated. What are you deciding between, the internship courses in Thailand? My preference would be the TEFL Heaven course. They have a very personalised approach to the program and the locations they use are by the beach - so Phuket, Samui, Krabi, etc, which makes for a better experience in my opinion. That said, i-to-i is a professional set-up too and they have a good reputation, though they are better known for their online courses. Hope this helps, all the best! Fantastic information, thank you! I definitely want to have a spell teaching in Thailand but I'm not sure I want to take my TEFL there. I mean I'd like to but I have commitments at the moment which makes planning a trip pretty hard.I work full time atm so I need something I could study with on the move; perhaps on the train.Any advice? Thanks again. Hi Amy, check out TEFL Pros. They have designed their course specifically for people like you who want to be location independent and learn on-the-go. I reviewed the course materials last week and it's very well done and presented by two experienced teachers. You get full accreditation, so you'll be able to teach anywhere in the world. They even post you out your certificate. Hi! I'm really excited about the idea of taking one of this courses and I really appreciate this post cause it really has helped me a lot. However I have a doubt and I was wondering if you guys could help me once again. I was in Thailand and I fell in love with Chiang Mai. Some of the courses kind of guarantee you a job after taking the course. Would it be anywhere in Thailand or would I be able to chose the location? More specifically I would love to stay and live in Chiang Mai. Do you think its possible? Hi Juliana, if you do the course with SEE TEFL they will help place you in a job in Chiang Mai. There are plenty of positions up there and SEE has a good relationship with local schools. Of course, it's up to you if you want to go elsewhere in Thailand and get a job. At a state-school teaching level the salary would be the same. It would probably make a difference at international schools where they want teachers with specific qualifications to teach certain subjects like Geography or Maths. But take this job for example. The qualification requirements are degree or TEFL/TESOL plus some experience teaching in a Thai school, which the on-site TEFL certification courses in my list give you. I'm surprised to see online programs on this 'definitive list." An online TEFL program will have very limited recognition. Schools want to see a "practicum" -- observed teaching practices - typically a minimum of 6 hours of classroom time. The practicum is the heart & soul of any reputable TEFL program.Learning the theory online does not prepare you for a successfully teaching English in a classroom. Every trainee we've taught got demonstrably better after their classroom teaching practices. There is no substitute for this. It's a key reason why most schools downgrade online-only programs.Yes, online programs are convenient, flexible and allow you to continue working, but there's a significant trade-off.The only online program to consider is some kind of Combined TEFL where you do the book online, but still do your practicum in front of real non-English speaking students. I absolutely agree that the classroom training is hugely beneficial, and I do state this in the post and recommend it as a preferred option. But I don't agree that an online TEFL program will have limited recognition; certainly not in Thailand anyway. I have met plenty of teachers over the years who took a reputable online course and had no problem getting a job. Those with the potential to be a good teacher go on to do just that.Moreover, there are numerous companies who advertise on my job board that accept teachers with online and offline TEFL training, equally.Four of the six in my table are on-site courses, and as you can see I put those who offer internships and TEFL + classroom training on-site as my primary recommendations, for exactly the reasons you state. Like you, I'd always recommend practical training; I am also an advocate of cultural immersion prior to taking a teaching position. However, it's important to offer my readers a balance of the options available, so that they can choose the option that best suits their current circumstances. I too would agree that one can get "a job" with an on-line only TEFL program. I would even stretch this to getting "a job" without any TEFL training whatsoever. The demand for English teachers is that great as I've written about here:But the operative words are "a job." As in "any teaching job. "Those same candidates might land much better jobs if their qualifications included a full TELF that includes a practicum. Thailand's most prestigious schools have a basic qualifications bar that they use to short list the hundreds of applicants they can get for a single position.And isn't it more than just Thailand? Some teacher candidates might want to take a longer view and pursue a qualification that would also be recognized by top schools in South Korea or Japan--and lot of other places around the worldSome of the students we've trained already had a an online TEFL--with teaching experience--but as they were moving out of Thailand, needed to upgrade their qualificatons for more demanding institutions.I get the diversity angle you're trying to get by your six picks. But I think that "balance of options" could be stressed. The way it's now worded with a headline that reads "My 6 Top TEFL/TESOL Course Company Picks", readers may see it as the "Top Six. " Again, there are programs that certainly would not be a lot of expert lists of 'definitive lists." Hi Peter, I have done some research on behalf of my wife, she has completed the TEFL course here in England, but it seems most companies want you to sign up for their course and then they will find you a job, but she has already completed the course. Are there any companies/agencies that will place you without taking the course again? I am pretty sure if you contacted a couple of the schools they would help you with finding a placement, because I'm quite sure they get a fee from other agencies for finding teachers. Failing that, there are plenty of teaching jobs out there. There's a few on my job board here. Hello. Thank you, this information is very helpful. I'd like to know about SEE TEFL you mentioned above, what do you mean by native english speaker here? In Thailand there are foreign teachers working in schools up until the ages 55-65 depending on the school.Generally speaking, there are no age limits to teach English abroad, but every country or school has different requirements and restrictions.There are many factors that contribute to age limitations. Sometimes it is a visa issue, and some countries are not permitted to give visas to teachers above the age of 60 or 65 due to legal retirement ages. Hello - Great article really helpful. I'm looking to do a TEFL course that will allow me to work anywhere and by the looks of it SEETefl looks like a great option as i plan to start out in Thailand, would you agree or would you recommend i-to-i as i would look to teach in other countries also? 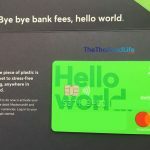 Are you aware if this company helps you with the basics like setting up a bank account and getting a Thia sim ect?? If you are looking to start in Thailand then SEE TEFL is a great choice. Chiang Mai is a good location too: friendly people, great food, decent town centre, plenty of nice scenery, good expat community of all ages, young and old. They will help you getting set up with things like accommodation, bank account, Sim car etc. Don't forget that help with all that stuff can be found right here on TTL too. Love the information you have given on the website. However looking at the teachers jobs on the site and others seems to all indicate that a degree is required. I don't have a degree however can't afford to take a chance an get a TEFL qualification if not having a degree will make it pointless anyway. Advice? Also what are the age requirements as I'm 31 and a female friend of mine whom hasn't got a degree who is interested as well is 37. Not yet I'm afraid, but I will get around to doing one soon. Good guide! Do you have an opinion on the in-country courses TEFL Heaven (and others) offer in Vietnam and Thailand by? Some offer guaranteed jobs after completion. Hi Tony, SEE TEFL in Chiang Mai is one of the best. I've heard back from a good few people who've taken the course and enjoyed it. They have a job guarantee too, with 95% of students getting work within 4 weeks. Chiang Mai is a great place to start out in Thailand too: cheap accommodation and food, very friendly people, easy to get around, lots of great temples and green spaces to see, plenty of other travelers/expats to meet with. It has great healthy food/living and music scenes too, if you like either of those things. Thanks for the reply! 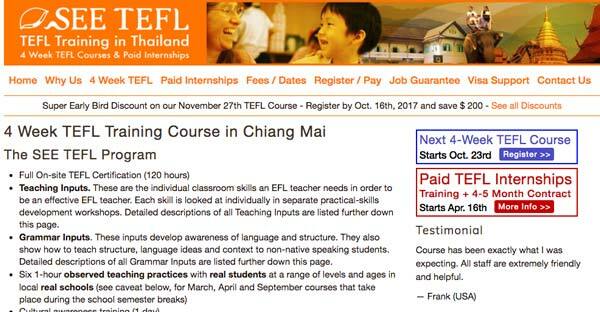 I have been to Chiang Mai and like it but Thailand has a max age restriction that Vietnam does not, and I am looking for opinions or thoughts on 'TEFL Heaven' or other schools that offer in country TEFL training + job guarantee in Vietnam. I realize you may not know them but would appreciate any feedback you or others may have. I haven't looked into them yet but have scheduled a call for January to get a better insight, so hopefully I'll be able to come back to you on this then, if not too late. Thank you! No, it won't be too late. Disregard; just adding a comment to get future notifications. HI. When do you expect to post your review of TEFL Heaven? Hi Kim, I don't think you should be scared, but be aware of the dangers for a woman traveling alone and be cautious in certain situations and don't do anything that you wouldn't do back home. Most crimes and related bad things usually happen when people put themselves in vulnerable positions, not just in Thailand but in any major city or tourist destination in the world, see my recent post on avoiding being a victim of crime here: Just follow the basic rules of not walking home alone late at night, not leaving your baggage unattended when traveling, etc. Also bear in mind that while Thailand seems kinda perfect when on holiday, it is like any other country once you live here in that you will have down days and miss home, but also fantastic experiences you will never forget, and meet people from all over the world. There are lots of expats, young and old, men and women, all living a good life in Samui and other parts of Thailand; many of whom will be happy to help you along. There's always lots going on and plenty of people to meet. When I first came to Thailand it was to Koh Samui; I then came back to live there for around 9 months or more. It was the best thing I ever did. In fact, the first Thai friend I made there remains a close friend today. Kim - You did not really mention what your major fears are in particular. For example, are you mostly afraid that as a single female traveler some physical harm might befall you? Or are you more afraid that you will not be able to find a job and in turn will run out of money and end up homeless in a foreign country?The latter was actually my greatest fear the first time I moved to Japan at just 24-years old. And I had good reason to be afraid with only $400 and a round trip plane ticket in my pocket. After all, if I had failed to find a job in time I would have been left with the choice of either being homeless in Japan or being homeless back in California. You see, I had nobody back home to take me in or help me out in any way should things fall apart, so I had nothing to come back to. Now, that’s what I call scary! But I did it anyway because, quite frankly, I would rather try and fail than just sit around wondering “what if” for the rest of my life.By the way, at that time I actually did get to the point where I only had enough money to stay in my room for two more days and I was facing the prospect of either cashing in the other half of my ticket for a little more money, or using it to go back home to nothing. But luckily that very same day everything just fell into place for me. First I just happened to meet this Korean guy on the street and later that day I met a Canadian guy at my rooming house and after talking that evening we decided to all become roommates. The next day one of the guys found a 3-bedroom house to rent and they let me slide on the rent until I got a job. Then the day after that I found a job through the American landlord of the house we were renting. I ended up staying for a year and then a few years later I went back for another 4 years.Anyway, if your major fear is being the victim of a violent crime - or even being killed - I personally would not worry too much about such things. As I said in an earlier post, the odds of such a thing happening to you is not really a whole lot greater than it is back in your home country. In fact, you are probably just as (or even more) likely to be raped on your own college campus back home than your are to be raped in Thailand. Also, excluding diseases and suicides, the most likely thing to kill a westerner in Thailand is a traffic accident.Of course I realize that most peoples fears are irrational and are not based at all on the odds. For example, some people are terrified of flying even though they are actually tens of thousands of times more likely to be killed in a car. So, nothing I can say will help with that. Ultimately you will either be able to confront your fears or you will not.As for any worries you might have about not being able to cut it over there, again, these are fears that you will ultimately just have to face, or not face. And as for passing a TEFL course and getting your certificate you can always just take care of that in your own country if you are worried about not passing. It’s not exactly rocket science though so I can’t imagine why you would fail the course. Still, if it worries you so much, you might want to contact the people who run these various programs and ask them what percentage of people typically wash out, if any.Of course, if you have fears about not passing the course then you likely also have fears that you might not be any good at teaching to begin with. All I can say to that is, I would not worry about it. In my experience most people who teach English as a second language abroad are mediocre teachers at best. And many are downright useless. So you would have to be a pretty piss poor teacher indeed to loose your job once you actually find one.Anyway, I hope this helps in some way. Kim,I’m sorry to hear that your friend had such an unpleasant experience in Thailand. This is exactly why I never accept teaching jobs or even enroll as a student in a school from outside of the country. Obviously there is a sense of security in having a job lined up before you relocate but I just don’t trust that things will be as described in the brochure once I get there. And let’s face it, there are shysters out there in every country who might try to take advantage of you. So, for these reasons I always need to see a place in person before signing on.As to why your friend was treated the way she was over there, there is really no way for anyone to know for sure unless she was specifically told the reason. From what you said however it does seem likely that either race or nationality had something to do with it. I don’t really see how her religion could have anything to do with it though (although TTL knows more about these things than I do). I do know that when I was teaching in Japan White teachers were by far the most in demand. And this is only natural since the White race is most often associated with the English Language in the minds of most people. It’s kind of like the way I prefer a Japanese Sushi Chef to a White one. The White guy might actually be a great Sushi Chef but my brain just tells me that I don’t want to chance it. And it’s often the same with foreign students wanting to learn English. This kind of subconscious bias does not really constitute racism though.Still, even if your friend would have to end up teaching in a different location than the others due to her background I can’t see any reason why she would be separated from the others during the course or would be treated badly. That just seems stupid and I would personally never do business with any organization that would do something like that.As for how the majority of Thais feel about Muslims or certain races in general I can’t really say. I do know that the older sister of a Thai girl I used to date was in a long-term relationship with a Muslim man at the time so obviously she had no problem with them. I suppose if you are non-White yourself by chance then you will likely find out for yourself should you go to Thailand.And as for your English abilities I’m sure they are more than adequate for teaching English in Thailand. But being a good teacher is not just about what you know. For example, the greatest dancer or martial artists in the world might not necessarily be very good at teaching what he (or she) knows to others. Some people are just natural born teachers and some are not. Of course, whether or not you make it in a foreign country has a lot more to do with your drive, determination, and attitude than your abilities as a teacher. I have decided to go ahead with getting my TEFL certification!! Not going to let one incident get in the way of my dream..i am nervous and excited at the same time! My boyfriend has been nothing but supportive of me chasing this dream. I really do hope i will pass and get to travel around the world. That’s great! Although I’m still not quite clear on why you would not just acquire your teaching certificate in your own country prior to planning your trip. Also, if you had mentioned before that you were still with your boyfriend I would have told you that your biggest concern should be whether or not your relationship can actually survive a year long separation and not those other problems that you have been concerning yourself with. After all, teaching contracts are typically for a minimum of one year and if you are going all the way to Thailand to get you TEFL certificate (as you originally stated) then I assume you would also want to actually land a teaching job while there. Ken makes a good point. For example, you could do an i-to-i Tefl back home, get your certificate and then fly out to secure a job, if that is you are worried about having a similar experience to your friend. Thank you for the advice! Really do appreciate it. Yes i will get my certificate in London before leaving to go over to Asia. Will be challenging working full time and studying. But i will balance it out so i will make time to study. My only worry is that i have no classroom experience so even if i pass and get my TEFL i will not have an real experience. Very few people who teach English as a second language go into it with any kind of prior classroom teaching experience so I wouldn’t worry too much about that. Speaking of which, I have actually been working on a write-up which details the ups and down of being an English teacher abroad and I will eventually post it somewhere (assuming I ever finish it). I’m hoping that sharing some of my own teaching experiences will give prospective teachers some idea of just what they are getting themselves into. When I first started teaching I was just thrown into the deep end and I had to quickly either sink or swim. Unfortunately, there was no Internet back then so I did not have access to the wealth of information and personal experiences that we have access to today. I guess it depends how much you are earning now and what lifestyle you are seeking to maintain or achieve. Presently I am drawing USD 1350 and leading a moderate life along my family.So If I shift what would be the average salary i can expect.I have 15 year experience in Accounts. Possibly. I think some agencies would take on native speakers with a degree only, but a TEFL is preferable because it teaches you how to deliver lesson formats and structures for taking lessons. Hi, please am a cameroonian I have taken the TEFL certificate in south africa and I want to move over to Thailand for a teaching position (still searching) will this be possible for me to get a job? Hi, non-native speaker positions are available. Perhaps try contacting some language schools and sending them your CV. You could also try to contact this company. Hi Shams, do you want to study inside Thailand? Or do you want to take the course in your home country or online? 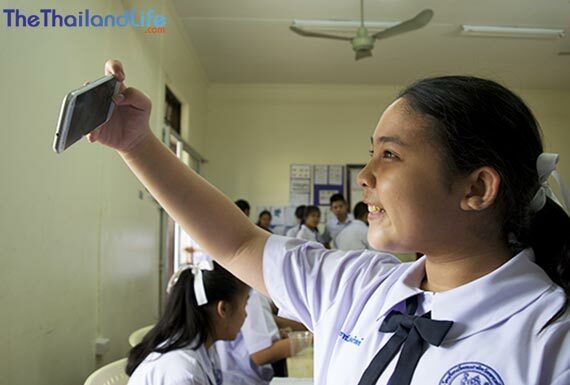 Hi Chailert, please check out the Job Board on https://www.thethailandlife.com/jobs, there's lots of teaching jobs posted there regularly. Unfortunately if Thailand is anything like Japan used to be it might be much harder for you to find a good English teaching job there than it would be for a White person. This is because the schools know that the students want a Western looking teacher. In fact, the first time I went to Japan in the 80’s there were actually quite a few English teachers from countries where English is a second language, like Germany for example. And although these teacher had thick accents and there English was far from perfect they could get easily get teaching jobs simply because of the way they looked. But it was almost impossible for an Asian person to get a job at an English conversation school no matter how good they were. The private schools just want as many paying students as possible and they know that most people have these subconscious prejudices. For example if some guy here owns an expensive Porsche or BMW he would probably much rather his mechanic be some German guy named Gunter than a Mexican guy named Jose. It’s not rational but that’s just how people are.Anyway I hope this is not the case in Thailand but its something to think about. And of course if you are looking for work at a regular public school and not an English conversation school then it probably will not matter as much. And just because you might have to try harder than others is no reason to give up. Hi Christo, yes, SEE TEFL graduates are teaching across Asia, Europe, Central and South America and the Middle East. It says here on the home page. Hi Rico, yes, you will be able to find a job. The TEFL is proof that you are a competent English teacher to a certain standard. Some countries do require that English be your mother language, but Thailand doesn't. Hi Javi, glad you found it useful. I wish you all the best with your studies and travel. Oh wow! This is awesome. So right now I'm weighing up doing the SEE Tefl in Thailand vs getting one online through the ITA and then going to Thailand after. What do you reckon is the best move? Hey Charlotte, I think SEE is a great option if you plan on teaching in Thailand afterwards, as they have a guaranteed job placement program. I had a friend who took this course and he said the cultural insight of studying in Thailand before teaching was valuable; not just the teaching side but actually living and going out in Chiang Mai. It made him decide if he wanted to stay there once completing the qualification, which he did and ended up staying for 2 years.